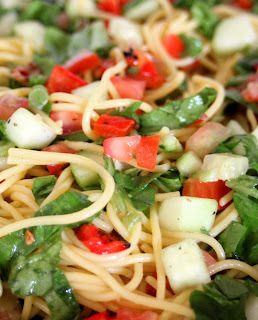 Summer is here and it's time to break out the barbecue and salad recipes! 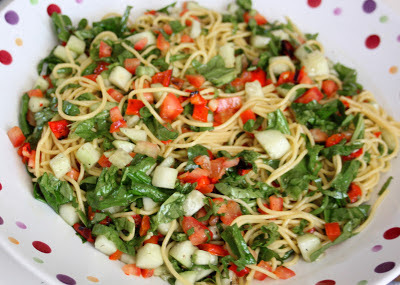 As bikini season approaches, its important to keep healthy and fit, so today I'm posting a delicious, vegan and gluten-free spaghetti salad! The dressing is simple to make but, of course, if you're attached to your favorite store-bought brand, it will work absolutely fine with this fresh and healthy dish! Cut the red bell pepper in half lengthwise. Remove the seeds and membrane. Place in the oven and broil for 4-5 minutes on each side, until brown and bubbly. Remove from heat, allow to cool for 5 minutes, chop and set aside. Bring a large pot of salted water to a boil. Add the spaghetti noodles, reduce to a simmer and cook for 7-10 minutes until the noodles are soft. Drain and rinse with cold water to cool, set aside. In a large mixing bowl combine spaghetti noodles, spinach, tomatoes, cucumber, scallions and roasted red pepper. Season with salt and pepper to taste. Stir well until all ingredients are combined. Toss in dressing and serve. Combine vinegar, Italian seasoning, garlic powder and lemon juice in a small mixing bowl. Season with salt and pepper and whisk until combined. Stream in olive oil while continuing to whisk until dressing is smooth and combined. Toss into salad and serve.